Kleine (ca. 20 qm), schön und komfortabel, kleine Wohnung hinter Sant 'Andrea della Valle Kirche, mitten im Herzen der Altstadt von Rom, wo Sie einen Bus brauchen. Piazza Navona, Pantheon, Trevi-Brunnen, der Piazza Venezia und die Kaiserforen: viele Restaurants, Tavernen, Geschäften und der malerischen Campo de 'Fiori Markt umgeben, liegt es ein paar Minuten zu Fuß von der schönsten Sehenswürdigkeiten von Rom entfernt. Erste Ebene: Wohnzimmer mit Sofa, eine Küchenzeile und ein Badezimmer mit Dusche. Zweite Ebene: Schlafzimmer mit Kingsize-Bett und einem Kleiderschrank. Transport: es ist gut mit den wichtigsten Sehenswürdigkeiten von Rom durch mehrere Buslinien verbunden. Apartment was small but great. 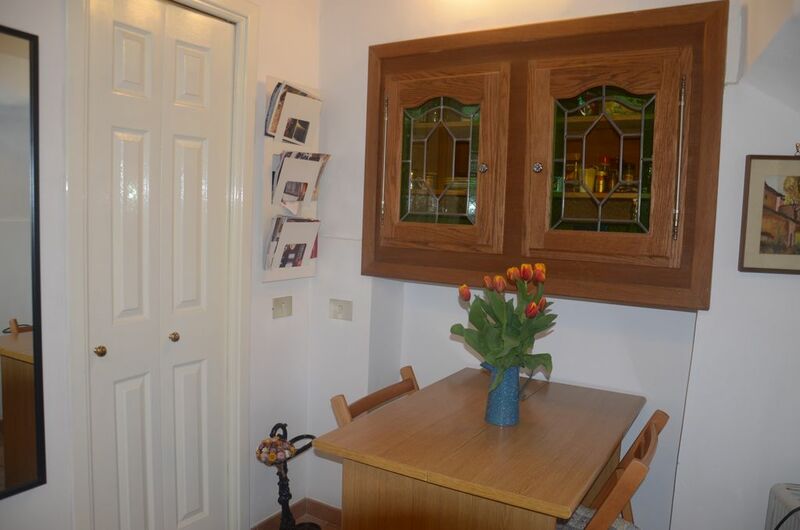 Wonderful location, everything within easy walking distance. Sergio is a very accommodating host. Be prepared for some street noise during the night...but not disrurptive. Great place to stay for your Rome adventure! We spent 8 days in Rome and we had a really great time. The apartment is tiny but has everything two on-budget travellers can possibly need. The location is perfect. Walking distance to pretty much all major attractions but if you don't fancy walking there are buses just around the corner as well. Restaurants, grocery stores, market, bakery, ice-cream parlour and much more just minutes away. Even though it's the very center of Rome, it's surprisingly quiet. The owner is very kind and helpful. The only thing that can be considered a bit of a challenge is the steep, spiral staircase that leads to the bedroom. For people with any mobility difficulties, the apartment might not be a very good idea. Other than that we give it thumbs up! My husband and I thoroughly enjoyed our stay at Via Dei Chiavari! It was our first stop on a 2.5 week vacation in Italy, and it was a wonderful way to kick off our trip. Though the flat is quite small, it was perfect for two people, and it was right in the heart of Rome, so we were able to walk everywhere (sites, museums, restaurants, the river, etc.) with ease. Sergio was an excellent host and gave us some great suggestions on food and things we should do. We loved staying there and would do it again in a heartbeat. I'm very glad you had a good time in Rome and in my small flatlet! Estuvimos 4 noches en el departamento con mi marido. La verdad es que nos encantó, muy completo con todo lo necesario para pasar unos días en Roma. La ubicación es inmejorable! cerca de lugares hermosos de la ciudad. Se puede ir a pie a muchos de los atractivos turísticos, pero además tiene muchas líneas de bus a pocas cuadras. Sergio nos estaba esperando cuando llegamos, es muy amable y atento. Sin dudas recomiendo este apartamento y vamos a volver pronto. Ho scelto questo piccolo appartamento guardando le foto e per la posizione, vicinissimo a Campo dei Fiori, ed è stata una scelta azzeccatissima. L'appartamento è piccolo ma dotato di tutti i confort, situato dietro Campo dei Fiori e la mattina si poteva andare a prendere paste e pizza in fantastico forno che era quasi di fronte all'appartamento, la sera si poteva girare come tranquillamente in centro e godersi le bellezze romane. Il proprietario gentilissimo e molto disponibile, segnalo anche che io avevo lasciato un mio oggetto personale nell'appartamento e lui me l'ha prontamente spedito. Lo ringrazio ancora per la cortesia. Consiglio l'appartamento per poter vivere Roma in maniera unica.